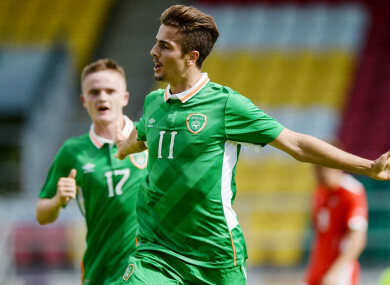 Elbouzedi celebrates scoring for Ireland's U19s against Austria in September 2016. WATERFORD HAVE AGREED a deal to sign former West Brom midfielder and Ireland U19 international Zack Elbouzedi. The 20-year-old joined the Baggies in 2015 and spent two years on the clubs books, moving to Inverness in 2017 where he made four appearances and spent a short loan spell at Elgin City in the Scottish fourth tier. The Dubliner moved to the Hawthorns from Malahide United and is known for his pace and technical ability. “I’m delighted to get everything done and it’s great to have my future sorted,” he said. “I’m excited by what Waterford has to offer and I’m looking forward to next season. Waterford manager Alan Reynolds and new signing Zack Elbouzedi. Waterford were promoted to the Premier Division a year ago and enjoyed an extremely successful first campaign back in the top-flight of Irish football. Earning 18 wins from 36 games, the RSC side finished in fourth place — earning a European spot which now guarantees their place in the first round of Europa League qualifiers next summer. Obviously the European football is a big plus and it’ll be nice to experience that,” added Elbouzedi. “It’s amazing where the club has come from in the last few years and it’s important that as a club we push on. “I just want minutes on the pitch now. I was at West Brom but it’s so hard to break into a Premier League team, then went to Inverness and I was flying at the start but got injured. So, I’m hoping to get into the team and get a run of games. Manager Reynolds led the Munster club to the SSE Airtricity League First Division title in 2017 and has ambitions to build on the club’s top-four finish this season. Elbouzedi has represented Ireland at U15, U16, U17 and U19 level, and the Waterford boss said that the midfielder will be an important asset in the final third next season. We’re delighted to welcome Zack to the club — he’s a great signing for us and he’s delighted to be here,” Reynolds said. “He’s a player who we think will really excite the fans, he’s quick and likes to attack and that’ll suit us. Zack has been over in England with West Brom and in Scotland too; even at 20 years of age, he brings experience to the club. Email “Waterford sign promising ex-Ireland underage international and West Brom midfielder Elbouzedi”. Feedback on “Waterford sign promising ex-Ireland underage international and West Brom midfielder Elbouzedi”.